Soon after completing his First Symphony, Tchaikovsky met the stimulating figure of Mily Balakirev, leader of the group of Russian nationalist composers based in St Petersburg that also included Rimsky-Korskov, Borodin and Mussorgsky. It was Balakirev who suggested and encouraged the composition of Romeo and Juliet (1869–70), and with the Second Symphony, composed in 1872 and performed in Moscow and St Petersburg the following spring, it seemed that the young Tchaikovsky had identified himself very closely with the nationalists’ goal of turning away from Western European models to create a specifically Russian symphonic style that would reflect the essential character of native folk music. They particularly admired the way in which Tchaikovsky found so many ingenious ways of presenting his folk-like material, inventing accompaniments and variations that preserved the original character of the melodies while showing them off from ever-varying perspectives. The name occasionally attached to the Second Symphony, ‘Ukrainian’ (or sometimes ‘Little Russian’), is due to the use of three Ukrainian folk tunes, though Tchaikovsky’s invention is so conditioned by his background that it is often hard to distinguish between borrowed and original themes. “As regards the Russian element in general in my music… I grew up in the backwoods, saturating myself from earliest childhood with the inexplicable beauty of the characteristics of Russian folksong.” He wrote this around the time (1879-80) when he made a thorough revision of the symphony, in particular virtually re-composing the main body of the first movement, and it is this revised version that is almost always played today. Despite his particularly Russian cast of mind, however, Tchaikovsky soon found that he had to distance himself from Balakirev and his circle, finding their attitude too limited and dogmatic for his own purposes. The symphony’s opening melody, heard on solo horn and then bassoon, is the first of the Ukrainian themes. It is treated quite extensively against changing backgrounds, providing an introduction for the unobtrusive entry of the main allegro theme, which is far shorter and more incisive. The Ukrainian theme’s reappearance in the development and coda is an emotional as well as formal device, stamping the entire movement with its character. 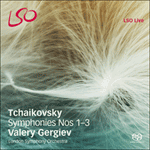 The vigorous, clear orchestration, and especially the bright wind writing here and throughout the symphony, reflects the great influence of Berlioz on so many Russian composers. The outer sections of the second movement are borrowed from the romantic opera Undine that Tchaikovsky had composed in 1869 and later mostly destroyed. Significantly, the opera was not on a Russian theme and (according to the composer himself) contained no specifically Russian material. The central section features a second Ukrainian tune, again presented against a background of changing accompaniments. The scherzo is notable for its irregular phrasing: instead of the expected four- and eight-bar phrases, it is grouped in phrases of three and six bars, with several teasing dislocations. The trio section is at the same quick tempo, but with a change from triple to duple time, and features a very folk-like (but apparently original) theme. After grand phrases on the full orchestra, a tiny and repetitive Ukrainian folk-tune called Zhuravel (The Crane) emerges to provide the main theme of the finale. It is a very simple tune heard over and over again, subjected to an ever richer and more elaborate orchestral treatment with constantly changing orchestration, harmony, texture, and accompaniment. A second theme in an oddly syncopated rhythm contrasts with its squareness, but in fact the very plainness of the ‘Crane’ theme throws Tchaikovsky’s virtuosity into high relief. It was after playing through this finale to a gathering at Rimsky-Korsakov’s house in St Petersburg at Christmas 1872 that the proud composer wrote “the whole company almost tore me to pieces with rapture”. Peu après avoir terminé sa Première Symphonie, Tchaïkovski rencontra Mili Balakirev, figure stimulante et chef de file du groupe de compositeurs russes nationalistes basé à Saint-Pétersbourg auquel appartenait également Rimski-Korsakov, Borodine et Moussorgski. C’est Balakirev qui suggéra et encouragea la composition de Roméo et Juliette (1869–1870), et avec sa Deuxième Symphonie, composée en 1872 et jouée à Moscou et Saint-Pétersbourg au printemps suivant, il semble que le jeune Tchaïkovski se soit identifié très étroitement à l’objectif que s’étaient fixé les nationalistes: s’éloigner des modèles d’Europe occidentale et créer un style symphonique russe spécifique, qui reflète le caractère profond de la musique populaire de ce pays. Ces compositeurs éprouvaient une admiration particulière pour la faculté de Tchaïkovski à trouver tant de manières ingénieuses de présenter son matériau d’inspiration populaire, à imaginer des accompagnements et des variations qui préservaient le caractère original des mélodies tout en les mettant en valeur au travers de perspectives toujours renouvelées. Le surnom parfois attaché à la Deuxième Symphonie, «Ukrainienne» (ou quelquefois «Petite-Russienne»), est dû à l’utilisation de trois airs populaires ukrainiens, quoique l’inspiration de Tchaïkovski soit si conditionnée par le contexte qu’il est parfois difficile de faire la part entre thèmes d’emprunts et thèmes originaux. «Pour ce qui est de l’élément russe, en général, dans ma musique … j’ai grandi dans des endroits reculés, m’imprégnant dès la plus tendre enfance de la beauté inexplicable des caractéristiques de la musique populaire russe.» Voilà ce qu’il écrivait à l’époque (1879–1880) où il révisa la symphonie en profondeur, réécrivant notamment, pour ainsi dire, le tronc principal du premier mouvement; et c’est cette version révisée qui est presque toujours exécutée de nos jours. Malgré sa tournure d’esprit éminemment russe, cependant, Tchaïkovski se rendit rapidement compte qu’il devait prendre ses distances de Balakirev et de son cercle, car il trouvait leur attitude trop borne et trop dogmatique pour servir ses propres desseins. La mélodie initiale de la symphonie, énoncée par le cor solo puis par le basson, est le premier des thèmes ukrainiens. Celui-ci est exploité assez longuement, avec des arrièreplans changeants, et sert d’introduction à l’entrée discrete du premier thème, allegro, qui est beaucoup plus bref et incisif. Le retour du thème ukrainien dans le développement et la coda est un procédé émotionnel autant que formel: il marque ainsi de son empreinte le caractère du mouvement tout entier. L’orchestration claire et vigoureuse, en particulier l’écriture brillante des vents, ici et tout au long de la symphonie, reflète l’influence importante de Berlioz sur tant de compositeurs russes. Les sections extérieures du second mouvement sont issues de l’opéra romantique Undine, que Tchaïkovski avait composé en 1869 et, par la suite, détruit Presque intégralement. Fait significatif, l’opéra ne reposait pas sur un sujet russe et (à en croire le compositeur lui-même) ne renfermait aucun matériau spécifiquement russe. La section centrale présente un second air ukrainien, énoncé à nouveau dans un contexte d’accompagnements changeants. Le scherzo est remarquable par l’irrégularité de ses carrures : au lieu des phrases de quatre ou huit mesures attendues, il est structuré en phrases de trios et six mesures, avec de nombreuses ruptures taquines. Le trio est dans le même tempo rapide, mais passe d’une mesure à trois temps à une mesure à deux temps, et présente un thème à l’allure éminemment folklorique (mais semble-t-il original). Bald nach Abschluss seiner 1. Sinfonie begegnete Tschaikowski dem inspirierenden Mili Balakirew, Anführer der Gruppe von in St. Petersburg wirkenden nationalrussischen Komponisten, zu denen auch Rimski-Korsakow, Borodin und Mussorgski zählten. Eben jener Balakirew schlug die Komposition von Romeo und Julia (1869–70) vor und ermunterte Tschaikowski zur Komposition. Dieses Werk wie auch die 1872 geschriebene und im folgenden Frühjahr in Moskau und St. Petersburg aufgeführte 2. Sinfonie geben den Eindruck, als ob sich der junge Tschaikowski sehr stark mit den Zielen der Nationalrussen identifi zierte. Diese Ziele bestanden in einer Abwendung von westeuropäischen Vorbildern und in der Schaffung eines eigenen russischen Sinfoniestils, der die wesentlichen Eigenschaften der einheimischen Volksmusik widerspiegeln würde. Die Komponisten um Balakirew bewunderten besonders die Art, wie Tschaikowski sein am Volkslied angelehntes Material auf zahlreiche einfallsreiche Weise vorzustellen vermochte sowie Begleitungen und Variationen erfand, die den ursprünglichen Charakter der Melodien beibehielten und doch aus ständig wechselnden Perspektiven neu beleuchteten. Der Untertitel „Ukrainische“ (oder manchmal „Kleinrussische“), der der 2. Sinfonie bisweilen zugeordnet wird, liegt in der Verwendung von drei ukrainischen Volksliedern begründet. Nun ist Tschaikowskis Kreativität so von seinem Hintergrund gefärbt, dass man häufig nur schwer zwischen geborgten und eigenen Themen unterscheiden kann. „Was das russische Element in meiner Musik im Allgemeinen betrifft … wuchs ich in der Provinz auf und saugte seit meiner frühesten Kindheit die unerklärbar schönen Eigenheiten russischer Volksmusik auf.“ [Alle Zitate sind Übersetzungen aus dem Englischen, d. Ü.] Tschaikowski schrieb das ungefähr zu der Zeit (1879–80), als er die Sinfonie einer umfassenden Bearbeitung unterzog, wobei er besonders den Hauptteil des ersten Satzes im Prinzip neu komponierte. Heutzutage wird fast immer genau diese bearbeitete Fassung gespielt. Tschaikowski kam trotz seiner ausgeprägt russischen Denkweise jedoch bald zur Einsicht, dass er sich von Balakirew und seinem Kreis distanzieren musste, weil er ihre Haltung zu eng und dogmatisch für seine eigenen Zwecke fand. Die einleitende Melodie der Sinfonie, die vom Solohorn und dann Fagott gespielt wird, ist das erste ukrainische Thema. Es wird auf wechselndem Hintergrund ziemlich ausführlich bearbeitet und liefert so eine Einleitung für den unauffälligen Einsatz des mit Allegro überschriebenen Hauptthemas, das weit kürzer und prägnanter ist. Die Wiederkehr des ukrainischen Themas in der Durchführung und Coda agiert als ein Gefühls- und Gestaltungsmittel, denn der Charakter des Themas prägt den gesamten Satz. Die lebhafte, transparente Orchestrierung, insbesondere der helle Holzbläsersatz hier und im Rest der Sinfonie, spiegelt den großen Einfluss von Berlioz wieder, der auch viele andere russische Komponisten formte. Die Außenabschnitte des zweiten Satzes stammen aus der romantischen Oper Undine, die Tschaikowski 1869 komponierte und später so gut wie vernichtete. Beachtenswert ist hier die Tatsache, dass die Oper kein russisches Sujet behandelt und (laut eigener Aussage des Komponisten) kein speziell russisches Material verwendet. Der Mittelabschnitt arbeitet mit der zweiten ukrainischen Melodie, wiederum auf einem Hintergrund wechselnder Begleitungen. Das Scherzo zeichnet sich durch seine irreguläre Phrasierung aus: Anstatt der erwarteten vier- und achttaktigen Phrasen erfolgt die Gruppierung in drei- und sechstaktigen Abschnitten, mit einigen neckigen Verschiebungen. Der Trioabschnitt hat das gleiche schnelle Tempo, wenn auch mit einem Wechsel vom Dreier- zum Zweiertakt, und ein sehr volksliedartiges (aber angeblich selbst komponiertes) Thema.